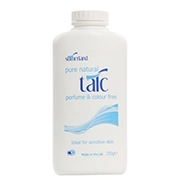 Sutherland Pure Natural Talc contains 100% natural talcum powder with no added perfume or colourings. It is ideal for all skin types including sensitive skin. Sutherland Pure Natural Talc is also gentle enough to be used on babies delicate skin, both after bathing and to help reduce the effects of chafing. The natural talc absorbs excess moisture to leave skin dry, smooth and soft. Sutherland Pure Natural Talc is used in hospitals and care homes around the UK and is also suitable for personal use. Sutherland Pure Natural Talc is Vegetarian Society approved and suitable for both Vegetarians and Vegans. Sutherland Pure Natural Talc is also proudly manufactured in the United Kingdom to Sutherlands high quality standards.